Primary Use: Utility metering, alarms and security devices, memory back up, tracking systems and professional electronics. 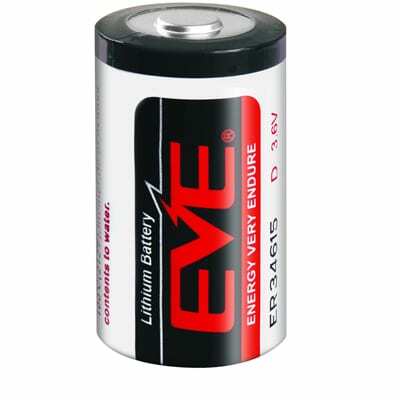 Lithium thionyl chloride batteries have a lithium metal anode and thionyl chloride(SOCl2) active cathode depolarizer and electrolyte solvent. Using bobbin construction is more suitable for low discharge current applications. Wide Operating Temperature Range: -60℃to +85℃. High Energy Density: 650wh/kg and1280wh/dm3. Low self-discharge rate: (less than≤1% per year at 20℃). So it can stored above 10 years at ambient temperature. Hermetic stainless steel container & Hermetic glass-to-metal seal. Due to IATA regulations, this item may only be shipped by road or sea freight. Information available upon request.